It was just a matter of time after the last cave-in by Google, that the FCC was going to make it all official. Today in a rather curiously timed vote, the Federal Communications Commission passed a set of rules that ostensibly seek to establish a framework for net-neutrality but in effect sets the idea of network neutrality down the path of exceptions which can only end in one day becoming as mind-boggling as the tax code. 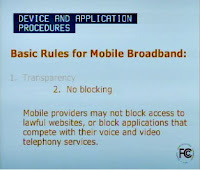 The illustrations are screen captures from the live hearing the FCC held for this event. Network neutrality is a simple concept. Network providers, that is your ISP that links you to the Internet, should have no say in the way the network is being used. In other words, as a service provider, their job is to link customers up, not limit or influence what the customers do with the link. This is important because the current innovation on the web required a significantly low barrier to entry. The bandwidth hungry YouTube of today would not have existed if the network deemed it to be less desirable compared to the much lighter Twitter. The business argument against network neutrality is that investment in network infrastructure depends on the amount and type of usage. And not having a seat at that table will result in a worse experience for everyone. 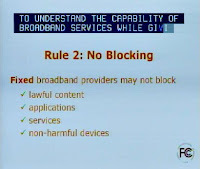 Till date there was not explicit rule guaranteeing the protection of network neutrality. All that changed with the latest hearings by the FCC. We have rules now, but they are the strangest set of rules for the weirdest of reasons. And toothless to boot. 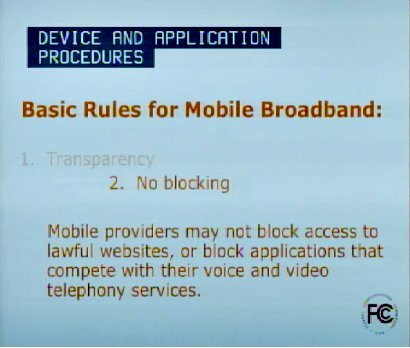 Starting with the images at the top, the current FCC proposal includes three rules - Transparency; No Blocking; and No Unreasonable Discrimination. First off the good - the principles themselves are robust enough. There is always going to be someone that seeks to circumvent the spirit for the letter, but in a broad sense these could well be the pillars of the definition of an open Internet. The fun is however lies in the details. Firstly, creating a rule that includes the word "lawful", includes just enough leverage to establish a monitoring and inspection regime to prevent illegal activity. The two biggest excuses - security and copyright protection. This has got to be one of the myriad goals of these rules. Second, apparently the Internet is different when you are walking on the street as opposed to sitting at home (see fourth slide). Google said so. This doesn't make much sense until you realize it is all about the apps. The apps have already created a form of stratified, non-interoperable web on the smartphone. 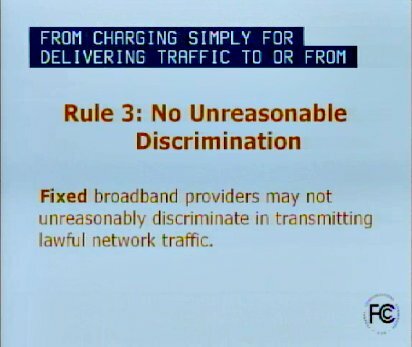 And what is more, your telecom provider can unreasonably discriminate between the apps. Would you then be surprised if YouTube on your telecom's $1.99 app played better than on Google's app? Thirdly there is no real enforcement. During the hearing, the counsel mumbled something about self-regulation. 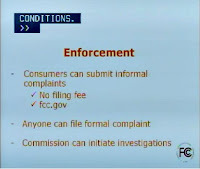 Though you do get to submit informal complaints to the FCC, for free! So in effect net neutrality gets more reports, and a promise for no unreasonable discrimination in traffic as long as you are sitting down. All bets are off if you use apps on your phone. And if things go south, there isn't much redress beyond what we have today - start a twitter campaign and pray. Yes that it so true, if there is some difference in delivery between home and "mobile" internet use outside, then you are correct that there is for sure NOT net neutrality.